With the sounds of rockets flying, wizzes and bangs in the background, bonfire night saw 64 brethren meet at Cleveleys Masonic Hall to witness Mark Spragg’s sparkling installation into the chair of Bispham with Norbreck Lodge No 4731. The brethren were extremely honoured to receive David Randerson Assistant Provincial Grand Master who was accompanied by fellow grand officers Peter Greathead the North Fylde Group Chairman, Harry Cox assisted by distinguished Provincial grand and acting Provincial grand officers John Cross, John Burgess, John Pitches and Ian Halsall Deputy Provincial Grand Director of Ceremonies. Picture left: David Randerson left) congratulates Mark Spragg Picture right: Father and son, Raymond and Mark Spragg. 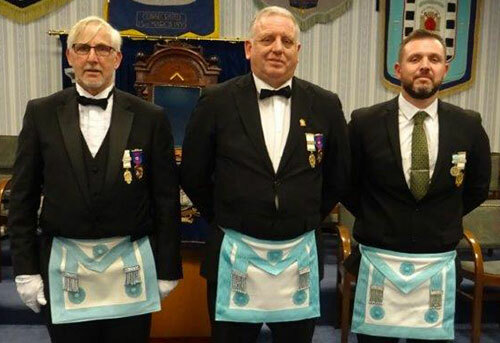 The installation was a team effort with members of Thornton and Cleveleys Lodge No 3854 (Mark’s mother lodge) assisting in Mark’s progression to the chair of King Solomon. Gordon Major welcomed all the visitors and proceeded to open the lodge and dispatch the administrative business in fine form. One matter of business was to ballot for a joining member, Mark’s father, Raymond Spragg. Gordon opened the lodge in the second degree and proceeded to ask Alan Fairhurst to act as installing senior warden. Likewise Michael Smiles to occupy the chair of junior warden and Steve Cullen to act as installing inner guard. 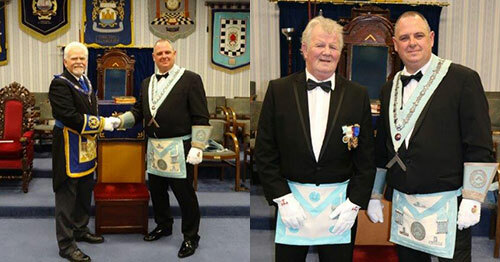 Gordon continued by opening the lodge in the third degree. At that point the PrDepGDC Ian Halsall entered to announce the presence of David Randerson. 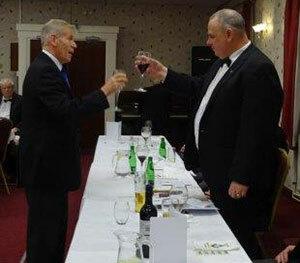 Gordon formally welcomed David to the lodge and proceeded to offer him the gavel of the lodge, David thanked Gordon and said that he had no doubt that he was in for an explosive evening with a backdrop of fireworks going off in distance and politely returned the gavel to Gordon. The working tools ‘dream team’ pictured from left to right, are: Jon Davies, Karl Taylor and David Hodges. In a touching scene it was Mark’s father Raymond Spragg who presented his son for installation. Gordon then invited Mark Tomlinson WM of Thornton and Cleveleys Lodge to assist him with the next part of the installation. Mark accepted and assumed the chair. Both Gordon and Mark ensured that Mark’s installation went off with a bang – full of colour and style. The installation ceremony being complete, David rose to bring the greetings of Provincial Grand Master Tony Harrison and congratulations to Mark on his installation. David said that he was sure that if Tony had been there he would have enjoyed the ceremony and the way members of other lodges had joined in. David said they Tony would have been extremely pleased to congratulate the two hard working installing masters, Gordon and Mark. Mark said he was pleased to present cheques to David for the sums of £150 to the West Lancashire Freemasons’ Charity, £450 to Trinity Hospice and £450 to Brian House. David thanked the members of the lodge for their generosity especially on behalf of the ultimate recipients of the money. Roger Lloyd-Jones (left) toasts Mark Spragg during the master’s song. At the festive board in response to the toast to the grand officers, David started by congratulating all those who had taken part in the ceremony, in what was a fine display of team work. David praised the ‘light blues’ who had presented the tools. He also asked that everyone supported the MCF 2021 festival and said that there had been 2,700 pledges so far for the steward’s jewel and he urged brethren to contribute and wear their jewel with pride. David moved on to the subject of Masonic halls and how brethren needed to look at alternative outside sources of income so that halls continued to be viable for the future generations of Masons. David said that everyone needed to look at increasing membership and just as much as getting young men interested in the Craft brethren should also look at men reaching retirement and looking for something to get involved in. In conclusion David thanked the acting officers for their support and in particular Ian Halsall the deputy DC. The master’s song was rousingly sung by Roger Lloyd-Jones, accompanied with style on the piano by Malcolm Burrill. In the response to his toast an emotional Mark thanked his father whom he had started his journey with at a double initiation into Thornton and Cleveleys Lodge. Mark also thanked all the visitors that had come to support him. In one of the penultimate events of the evening the raffle raised a magnificent amount of £356 that will go to Masonic and non-Masonic charities. The events of the evening closed with a bang with the tyler’s toast in the very capable hands of Gordon Ivett whose sparkling rendition never disappoints. Pictured from left to right, are: John Pitches, Peter Greathead, Harry Cox, David Randerson, Mark Spragg, Gordon Major, Mark Tomlinson, John Cross, John Burgess and Ian Halsall.